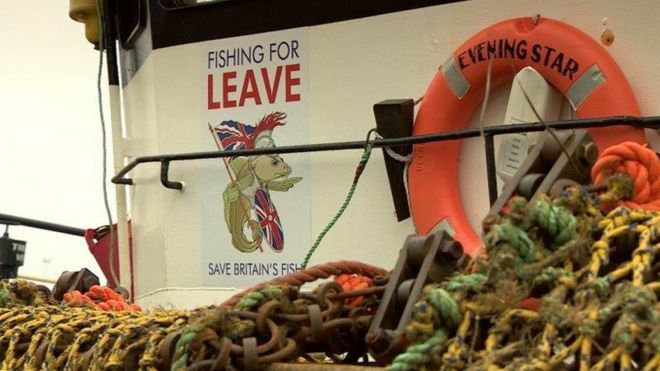 Fishermen in the north east of Scotland have launched their campaign for the UK to leave the European Union. The Fishing for Leave group said the Common Fisheries Policy has been a "disaster" for the industry. However, others in the sector have warned that rushing to exit could "knock the industry back 10 years" and throw it into "crisis". A referendum is being held on 23 June to decide whether Britain should leave or remain in the European Union. 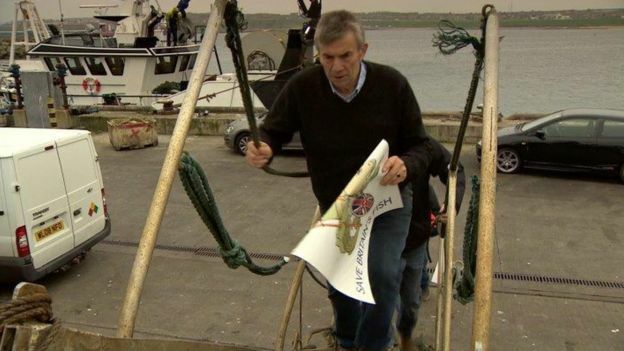 Former skipper John Buchan and owner of the Atlantic Challenge is part of the Fishing for Leave campaign. He said other countries' industries had flourished while Scottish fishermen have lost out. "I started at the sea in 1972," he said. "The first vote I ever took was the referendum and I was told it was going to be a common market. "I voted to enter but I know it was the biggest mistake I ever made, and I have waited 40 years for this chance. "In the 70s we got grants and the fleet expanded. It got far too big. We got a smaller share of the cake. Every decision is made in Brussels." He added: "We are asking to leave. With decisions, we will have the final say." However, there are those in the industry who believe the UK would be better to remain part of the EU. 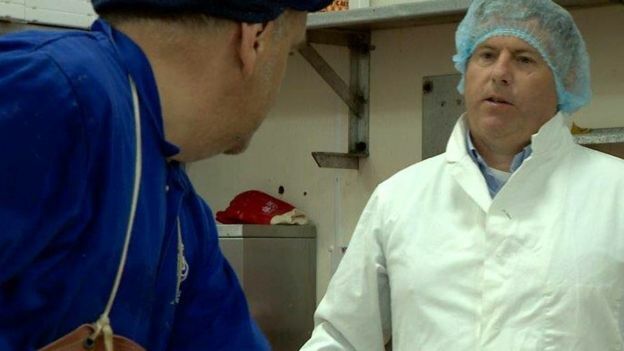 Aberdeen fish processor Andrew Charles said he fears for a future outside the union. "The problem that we have is if we come out what do we put in its place?" he said. "We have a management plan and from my experience that is slowly starting to work. Every stock is sustainable. "If we were to come out of Europe we could find ourselves with management being controlled by a Westminster government. How would they cope with that?" He added: "I let evidence speak for itself - we have a growing fishing industry. "Our fishing industry would be knocked back 10 years, throwing it into crisis. It's not perfect, fishing management is very complex." This week DEFRA issued a statement purporting that “Being Part of the EU is better for Fish and Seafood”- as reported in the Fishing News 2/01/16. It would seem that the government, not content to spend £9 million of taxpayers money on Mr Cameron’s EU propaganda pamphlet, now have government departments issuing propaganda for the Remain campaign too. DEFRAs statement is actually in contravention of the Purdah period, started on the 27 May, which forbids government departments from intervening in a referendum or election to effect or influence its outcome. Taking the lead from Mr Cameron and Downing street, DEFRA have concluded that they, and the British people, are incapable of conducting our own affairs. In the case of fisheries, DEFRA’s advice is to continue to hand British affairs to unelected EU bureaucrats who have no obligation or responsibility to the British electorate or Britain’s interests. One is compelled to ask that if a government department feels they need to subcontract the administration of our country to the EU then are they admitting they are not fit for office or government? On trade DEFRA says that we must remain in the EU because it is “the biggest export market for fish and seafood”- yet Norway and Iceland manage to export seafood to the EU far in excess of the UK but are not members and don’t struggle. Furthermore it is fundamentally obvious that you need to be allowed to catch the fish in order to sell it- the EU is crippling our ability to catch to supply this “big export market”. If there is such a high level of exports then prime British seafood is obviously in demand and that demand from the consumers will remain whether we are signed up to a political elites pet project or not. DEFRA note that we “export fish and fish products worth £1bn” – If Britain reclaimed the 60% of quota in British waters held by other EU members then this figure could more than double. Currently we are allowing the raw product to be taken for free to the markets on the continent losing the financial benifit of this fish to boats and processors and undermining our market share overall. There is no question- trade would continue as Britain and Norway would control a vast proportion of the EU’s seafood supply. DEFRA say- “fisheries issues don’t affect just one country… we need to work on shared solutions”. We would agree- However you do not need to sacrifice your soveriegnty, freedom and control to work with your neighbours- this is a meek excuse to justify political union. Norway manages to co-operate and negotiate with the EU and in doing so safeguards her industry AND still gets a good deal. This statement is based on the ideal that – “we have to sit at the table”- would it not be better to sit at our own table deciding our own affairs as one whole rather than 1/28th? DEFRAs most insulting comment is ” the EU allows the UK access rights to fish in other countries waters .. worth £100m“. Seeing as we have the richest fishing grounds in Europe recipricol access is a one way street- for the “£100m we get in return we lose Billions. DEFRA also state “if we leave the EU we wouldn’t automatically control our fishing waters”. However this mis-represents the central point of what this referendum allows- the restoration of national control. Upon leaving the EU Britain would control her own waters within the 200 mile/median line zone as per international law. It would then be up to Britain alone to decide how the resources within should be managed – just as in Norway or Iceland. Like Mr Cameron, DEFRA lay claim to having “reformed the CFP” -which they haven’t- any superficial alterations the core tenants of the CFP remain the same today as in 1970 – Common EU waters operating under the principle of equal access to a common resource for an EU fleet. By the content of their statement DEFRA are making it very clear they wish to remain a regional department- as one twenty-eighth of an EU Common Policy- enforcing EU laws. The British people and British fishermen are better than that and deserve to control their own resources and futures through their elected and accountable representatives in government- that is what this referendum is about- long term survival not short term pounds and pence. DEFRA’s statements are the usual feeble establishment excuses to justify a political project- that by somehow giving away our rights we receive “benifits”. Yet so great are these benifits we have yet to hear of a positive case for Remain. If we were run by a political class genuinly interested in Britains strategic interests we would safeguard our own resources for our own benifit- not open them to competition from every nation and watch our national wealth and infastructure be bled away. Should Britain choose to leave the EU then DEFRA, who by their own admission feel unable to manage Britain’s maritime resources without EU instruction, will have to be replaced. It is a disgrace the Government, led by Mr Cameron, have broken the spirit of how a fair referendum should be conducted. Like Edward Heath, who regarded the people’s marine resource and the UK Fishing Industry as politically expendable so do the present regime- they consider the whole country as expendable to further the EU project. There is a bright future for Britain free from the EU- Switzerland, Norway, Faroe, Iceland, and Greenland are small nations that show how it can be done- especially, in the case of the later 4, regarding fisheries. If these small nations prosper by managing their own affaris why can’t Britain with 65million people and abundant resources? Leaving the EU would give us a chance to manage our fisheries for our interest and to rejuvenate our coastal communities. It is time for the people to take back control of what is rightfully theirs and operate British resources free the EU politics of integration . It is time for Liz Truss to GO and for George Eustice to step up. Therefore, for this to happen Britain and the British people must win back our freedom to decide who governs us and how and Vote to Leave on the 23rd of June.